US - August pork exports increased from the previous month but were down slightly year-over-year. Pork exports totaled 183,658 mt in August, down 2 per cent year-over-year, valued at $511.4 million, down 0.3 per cent. January-August volume remained 9 per cent above last year’s record pace at 1.61 million mt, while export value increased 11 per cent to $4.21 billion. Exports accounted for 23.1 per cent of total pork production in August (down from 24.1 per cent a year ago) and 19.2 per cent for muscle cuts only (down from 20 per cent). For the first eight months of the year, the percentage of total production exported was 26.9 per cent (up from 25.4 per cent last year). For pork muscle cuts only, the percentage exported was 22.4 per cent (up from 21.3 per cent). Export value per head slaughtered trended lower in August at $47.98, down 3 per cent from a year ago, but the January-August average was still up 8 per cent to $53.28. "As we head into the final quarter, 2017 is shaping up as a very solid year for red meat exports but one in which the US industry still faces significant challenges," said USMEF CEO Philip Seng. "We have new pork plants coming on line and strong cattle-on-feed numbers, which sends a positive signal to our international customers about product availability. But the international markets are increasingly competitive, so we must continue to aggressively pursue new opportunities for US red meat products in both our traditional mainstay destinations and in emerging markets." Pork exports to Mexico remained on pace for a sixth consecutive volume record in August, with volume up slightly from a year ago to 65,037 mt. Export value also increased slightly to $129.6 million. Through August, exports increased 18 per cent in volume (522,227 mt) and 22 per cent in value ($984.1 million). Exports to Japan, the leading value market for US pork, declined in August as volume dipped 9 per cent to 31,863 mt and value was down 7 per cent to $140 million. Through August, exports to Japan remained modestly higher year-over-year in both volume (260,352 mt, up 1 per cent) and value ($1.07 billion, up 4 per cent). August chilled pork exports to Japan were the largest since March, though January-August volume (142,927 mt) was still down 3 per cent from last year’s record pace. Chilled export value through August was $674.2 million, up 3 per cent from a year ago. The US competes primarily with Canadian pork in Japan’s high-value chilled pork market. While August exports slowed year-over-year, US pork continues to capitalize on strong red meat consumption growth in South Korea. 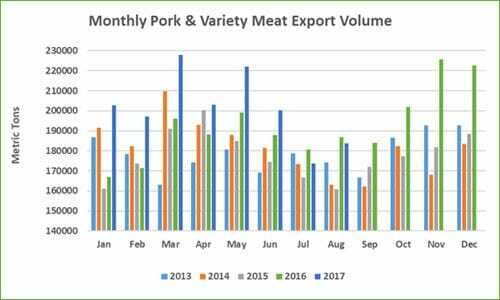 January-August pork exports to Korea climbed 27 per cent in volume (111,271 mt) and 32 per cent in value ($305 million). Korea is an especially strong destination for pork used in further processing, but the market is highly competitive with the US, Chile and the European Union shipping pork to Korea duty-free under their respective free trade agreements. Canadian pork also enjoys reduced duties under an FTA with Korea. In the China/Hong Kong region, August export volume was lower than a year ago but rebounded compared to the previous month. August exports were 34,616 mt (down 8 per cent year-over-year but up 8 per cent from July). Export value was $78.3 million, up 1 per cent year-over-year and 14 per cent above July). January-August exports to the region were 8 per cent below last year’s pace in volume (341,080 mt) but down only 1 per cent in value ($705.5 million). Led by strong growth in Colombia, Chile and Peru, pork exports to South America remain a record pace with a near-doubling of export volume (63,922 mt, up 96 per cent) and value doubling to $164.8 million. Despite slowing modestly year-over-year in August, pork exports to Central America are also on a record pace. Led by mainstay market Honduras, export volume reached 43,917 mt, up 5 per cent from a year ago, valued at $105.7 million (up 7 per cent). Strong growth in the Philippines and Singapore fueled a 22 per cent increase (to 30,284 mt) in pork exports to the ASEAN region, valued at $78.4 million (up 33 per cent).